Study the safety rules sheet. 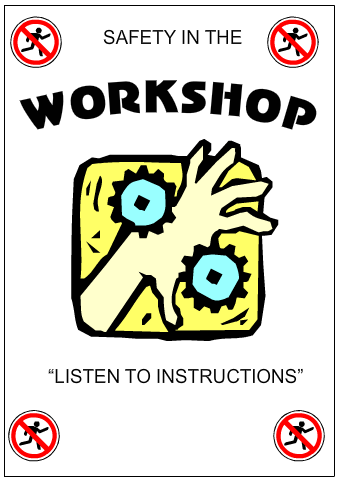 The design a Safety Poster that could be displayed in a workshop. It must clearly encourage pupils to follow the rules. The poster should be drawn accurately and include colour and shade. Two examples are shown below. They both have symbols for the corners and a simple border. The title "Safety in the Workshop" appears prominently in both. Other drawings have been added as well as colour and shade. The message is simple and easy to understand - SAFETY.